улучшенная версия курицы — летает, имеет неуязвимость и ускорение. Creates a small very fast flying unit that can carry dotawar_items to and from your base. If it dies the dotawar_items will fall to the ground. Has magic immunity, high mana, hitpoints and armor. Cannot carry Gem. Can cast Burst. A circlet with faint whispers echoing about it. Gives +3 to all attributes, and an additional +3 to agility. A small gemstone attached to several chains. Gives +3 to all attributes and an additional +3 to intelligence. Grants a +0.65 Brilliance Aura, a +3 Devotion Aura, and +6 damage. A decorated wrist band. Gives +3 to all attributes, and an additional +3 to strength. Creates a soothing aura that restores hit points for nearby units. Gives +2 to all stats and heals all allies in area for 2 hit points per second. A powerful shield that imbues the bearer with the strength of heroes past, giving +5 armor, +2 All Stats and, when activated, gives 2 bonus armor to nearby units. Increases movement speed by 70, attack damage by 16 and armor by 7. Can be cast to ignore movement pathing and give movement increase for 5 seconds. Casting spells removes the buff. A quarterstaff created by the master weaponsmith, Jax. Deceptively hidden as an ordinary quarterstaff. Adds 10% attack speed, 75% mana regeneration, +6 intelligence, and +15 damage. A powerful jeweled ring that glows with intense magical energy. Gives +3 Armor and +300 Mana. Can cast Replenish to restore 135 mana to a 400 AoE around the caster. A gem that grants heart to the bearer. Gives 125% enhanced mana regeneration, 5 per second hit point regeneration, and +10 damage. The powerful headpiece of a dead necromancer. Gives +5 armor, +20 damage, 15% life steal, and the ability to Dominate creeps. Name brand sneakers. Increases movement by 65, strength/agility/intelligence by 10 and attack speed by 30%. Click to change form. Preserved through unknown magical means, the Hand of Midas still retains much of its original potency. Grants +30% increased attack speed, and the ability to instantly turn creeps into gold. This Mask looks so strange that it drives you insane. Grants 17% life steal and allows you to go into a Frenzy. The frenzied state adds 75% attack speed and 15% move speed, but you take 20% extra damage. An eerie mask that is haunted with the malice of a fallen vampire. Grants a +16% Lifesteal Aura (melee), +0.8 Brilliance Aura, a +5 Devotion Aura, and +15% damage Aura. Increases the attack damage by 22 ,armor by 5 when worn and intelligence by 10 .When activated , any demage u take will be returned to enemy units. Yasha is regarded as the swiftest weapon ever created. The few that have wielded it say that it has no weight whatsoever. Adds +16 agility, 10% increased attack speed, and 10% increased movement speed. The discarded mantlet of one of Gul'dan's Death Knights, Vanguard defends its wielder from even the most vicious of attacks with ease. Gives +300 hit points, 5 hit points regenerated per second and 65% chance to block 40 damage. Named after a decisive battle in the War of the Magi, in which the Rebels rescued Roshan from his imprisonment at Crystalys. Adds 35 damage and has a 10% Critical Strike for 1.75x damage. A furred, magic resistant headpiece originally worn by Orcish shamans during conjuration ceremonies, it also heightens the life regeneration rate of whoever wears it. Gives +30% magic resistance and +8 hp regeneration. A glowing jewel formed out of assorted parts that somehow fit together perfectly, Mekansm protects its bearer from danger. Gives +5 to all stats, +5 armor, 3 HP regen aura and +2 armor/250hp AoE heal. Increases movement speed by 85 and allows the hero to Teleport to a friendly non-hero unit with a cooldown of 60 seconds. Considered the holy grail of necromancy and demonology, a powerful malefic force is locked within its pages. Gives +15 intelligence, +6 strength, and the ability to summon 2 Demon Mages with unique abilities. The abilities and stats become more powerful with each upgrade. Can be upgraded twice. Heirloom of the Cult of Mordiggian, who in ancient times obtained cursed immortality by eating the flesh of the being they worshipped, losing their souls in the process. Similarly, heroes invoking this withered remnant enter a dark pack, exchanging their own life force for an unholy strength. Gives +9 damage, +15% attack speed, +5 armor and + 3 hp/sec. Casts Unholy Strength. A lesser scepter that has been duplicated time and time again. Gives +12 Intelligence, +9 damage, +3 to all stats, and a 400 damage Energy Burst. The Energy Burst can be upgraded by combining this Dagon and the Dagon recipe. A very powerful relic, a reminder to us of the archaic age. Grants the hero +16 Intelligence, +100% enhanced mana regeneration, and Cyclone. A powerful weapon, used to bash skulls in. Adds 30 damage, +3 Strength, and has a 10% chance to Bash for 25 damage and stunning for 1.1 seconds. A hammer forged for the gods themselves, Maelstrom allows its user to harnass the power of lightning in attacking. Gives +6 Agility, +25 damage, and a 20% chance to release a 150 damage Chain Lightning. A powerfully enchanted blade that adds 22 Agility, 6 Intelligence, Feedback (burns 18 against heroes), and can cast Purge. The crystalized Soul of an ancient dragon. Gives 450 hit points, 400 mana, 10% enhanced mana regeneration and 1 hp regeneration. The legendary Lothar's blade that was dropped during the Second War. Grants +38 damage, +10 Attack speed, and a 9 second Wind Walk (Grants invisibility and +20% movement speed). A powerful rod imbued with the strength of giants. Adds +10 Strength, +24 damage, and the Avatar ability, which lasts 10/9/8/7/6/5 seconds. The user becomes a powerful killing machine. Gives 150% enhanced mana regeneration, 6 hit points regenerated per second, +65 Damage, and 35% Cleaving Attack. A wicked weapon, used in torturing political criminals. It hungers for blood. Adds +60 damage and reduces the armor of enemies you attack by 6. Said to have belonged to a goddess, this magical piece of armor was forged by divine wisps in the deeps of Winterspring and even today it retains much of its former power. Grants +15 Armor, +30 Intelligence and a −25% AS aura. Upon activation, emits a frigid blast, slowing enemy movement speeds by 40% for 4 seconds and deals 200 damage. A unit hit by this cannot be affected by it again for 30 seconds. Sange and Yasha, when attuned by the moonlight of Tir'nogth and used together, become a very powerful combination. Gives +16 agility, +16 strength, +15 damage, +12% movement speed, +15% attack speed, and a 15% chance on hit to maim the target. A garnet rod constructed from the essence of a fire demon. Orchid Malevolence can burn away an enemy's spellcasting capabilities for a limited time while amplifying damage the target takes. Gives +25 Intelligence, +35 damage, 40% increased attack speed, +150% mana regen, and the ability to soul burn an enemy for 4.5 seconds (Silences and amplifies incoming damage by 15%). The last of the blood artifacts forged by the powerful Hemomancer Erythros centuries ago. Grants +450 hp, +400 mana, +200% mana regen, +6 hp/sec regen. You gain 2hp/mp extra regen per second for each charge. When you die this restores 450hp/400mana to nearby allies. You respawn faster and lose less gold (better if you have charges). While dead you gain XP and vision in that area. This magical sphere once protected one of the most famous heroes in history, Linken's Sphere has the power to negated most targeted spell once every minute. Gives +15 All stats, 6HP/Sec, 150% mana regen and spell negation. A powerful artifact created for the wizard Aghanim. Gives 5 HP regenerated per second, 150% increased mana regeneration, +40 damage, and the ability to instantly refresh all ability cooldowns. A divine weapon that gives +60 damage and a bright burning effect that damages nearby units for 35 damage a second and causes them to miss on 8% of their attacks against Radiance's bearer. A powerful staff used by a martial arts master. Grants +75 damage, 15% increased attack speed, and a 30% chance to deal 100 bonus damage on every attack stopping channeling spells. A powerful artifact that provides heart for heroes. Adds 35 strength, 300 hit points, and regenerates 1% total hit points per second. Guinsoo's flaming staff that he uses to turn people into sheep on a whim. Grants +35 intelligence, +10 strength, +10 agility, +200% enhanced mana regeneration, and the ability to turn units into sheep for 3.5 seconds. A funky looking axe that grants +6 Intelligence, +30 Agility, +250 HP, Feedback (burns 40 mana), and allows you to create 2 illusions of yourself that deal 40% damage and receive 300% damage. When Blizzard made Buriza in .08 it was good. Then they decided it wasn't good enough. So in .09 they IMPROVED it. Gives +75 damage and a 20% Critical Strike for 2.2x damage. The Butterfly is a blade that was magically created for use in the War of the Magi, but never used. Only recently recovered from the Avalan vault, it grants its bearer +30 Agility, +30 damage, 30% increased attack speed, and 30% Evasion. The scepter of a wizard with Demigod-like powers. 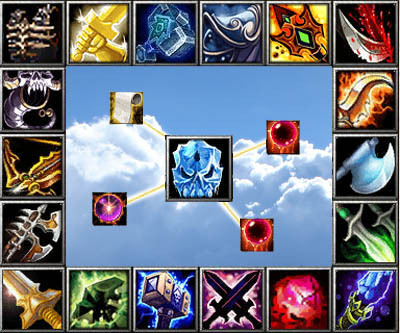 Adds 30 Intelligence, 500 mana and 500 life, and improves the ultimate for Lina, Zeus, Furion, Pugna, Rylai, Rhasta, Queen of Pain, Venomancer, Lich, Leshrac, Lion, Necrolyte, Keeper of the Light, Luna, Doom Bringer and Orge Magi. Forged in the depths of the river Styx, this hellish mail provides +10 armor, +5 armor aura, −5 armor aura, 40% increased attack speed and +15% attack speed aura. Powerful weapon said to have been wielded by Drak'thul himself, the Satanic gives 25% life steal, +25 Strength, +5 armor, and the ability to Death Pact creeps (85% of life into hp and 15% of life into mana). The Divine Rapier was granted by God himself to the rebels in the War of the Magi. Grants +200 damage, but drops if the user dies. Thor's magical hammer, made for him by the dwarfs Brok and Eitri. Gives +35 Agility, +35 damage, and a 20% chance to release a 200 damage Chain Lightning. When a hero with the Static Charge buff is attacked there is a 20% chance that a 200 damage Static Charge will strike the attacking unit. Static charge activates at most once per second. The Eye of Skadi is an extremely powerful ancient artifact that adds +25 to all stats, 150 mana, 200 life, and grants Frost Attack. Хахах!!! Gif изображения нельзя импортировать! xDD Нужны blp МОДЕЛИ ДЛЯ ИМПОРТА!!! приф народ, никак понять не могу, видал игру друга, у него скорость атаки была нереальна (на имбе играл, скилы подбирал сам) мне вот интересно узнать как у него получилась такая нереальная скорость, не могли бы подсказать?